Allegiances in sports are often built around community. I live on the South Side of Chicago, for instance, and it is not always safe to wear my Cubs hat around my neighborhood. But my neighbors, much like their North Side counterparts, are all Bears fans, and if you’re Catholic, and especially if you’re Irish, you are a Notre Dame fan, whether you live in the city or in the suburbs or within 200 miles of South Bend, Indiana. I have thought a lot about allegiances through the years. I was raised in Europe before we moved to Los Angeles when I was 7-years-old. Several years later we moved to the Pacific Northwest. As a teenager, my sporting allegiances followed my father’s. He was raised in San Francisco, and he would sneak in to Kezar Stadium to watch the 49ers play with his older brother Nick. He was a 49ers/Giants fan through and through, and so was I. At least until I decided to like the Dolphins one year. But after they were routed by my dad’s 49ers, I quickly made my way back into the family fold. Living in Oregon brought a pressure from the north and the south. To the north were the lowly Seahawks and Mariners from Seattle. During the years that I lived in Oregon, both teams seemed far more cursed than the Cubs. And to the south were the mighty 49ers and the Giants. It was not a difficult choice. 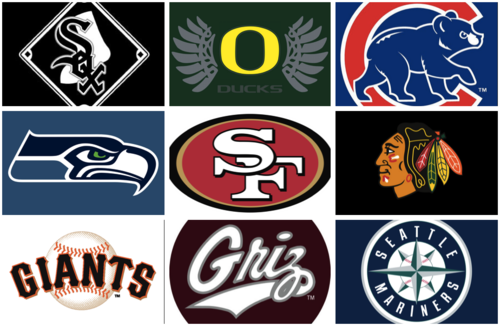 But seeing a team play often meant feigning interest in the Seahawks or the Mariners. After my children were born, it was natural for them to pick up on family allegiances, but there was pressure too from their peers in school. I’ve always been interested in how those pressures shape a child. But as a journalist who moves around every few years, my kids’ allegiances are as complicated as a small European country during the Napoleonic Wars. When we moved to Montana, it was an 8-hour drive to Seattle, so naturally there was that pressure from the west. But Denver was a 12-hour drive to the south, and many of our friends align with the Broncos on any given Sunday. There are also local colleges to consider. The University of Montana Grizzlies made two trips to the national championship game for their division during our three years in Missoula. Alaska is a five-day drive from Seattle, but the state bleeds green and blue. The one-time and still supply hub of Seattle is more a large Alaskan city then the Emerald City of Washington and the Pacific Northwest, at least in the minds of most Alaskans. But the west is vast and open, and allegiances are forgiven in the emptiness of a region where people rely on other people for survival. Not so much in the Midwest, where an 8-hour drive can put you in any of a dozen different Major League ballparks and half a dozen NFL stadiums. Allegiances are time honored and geographical. The lines are cut like the world’s super powers divided the Middle East after the Second World War. And here, finally, my children have come face to face with their identities as they relate to their allegiances. My boys wear White Sox hats like their classmates, though they secretly cheer for our beloved Giants. The proximity to two World Series titles in the last few years keeps them in that fold for now. Though I suspect the longer we stay in Chicago, the less that allegiance will hold. They have no love for the Bears, but they cannot help but fall into those Monday morning conversations with their friends, nor can I ignore my neighbors and the discussions we have while standing out by the mailbox. Even though I only watch my 49ers play on Thursdays, Sundays or Mondays, I have to know the basics of every Chicago Bear game, and I have to have an opinion on Jay Cutler’s performance. The same can be said of the Chicago Blackhawks. We are not a hockey family. Ice is not common in the soggy Pacific Northwest from which we hail. But this year we became forced fans in the city’s exuberance of a well-earned Stanley Cup. We attended viewing parties, and it’s not difficult for the kids to get swept up in the thrill of it all, even though I truly don’t care all that much about the sport still. The unspoken glue that holds us all together might just be the one thing we have carried with us on our sojourn. That is our love for my alma mater and it’s well-funded, technically clothed football team. The Oregon Ducks represent more than a college football team. They are an embodiment of something that we all cling to – home. When they win, there is pride in where we came from and what we still carry with us. There is the knowledge that so many others, our friends and our families, are watching along with us. When they lose, there is pain and a reminder of what we left behind. The Ducks are the one piece of sporting allegiance that is never questioned or forsaken. We have been in Chicago for a little over a year now. Far too short a time to break down our traveling allegiances but long enough to know a little bit about everything. That’s part of the art of fitting in, after all. Our neighbors have lived here their entire lives. Their allegiances are as set in stone as they are. No threat of moving away and no threat of new allegiances forming. And I wonder how long it will take my kids to become wrapped up in this place and its baseball, football and hockey teams? Already I see them wearing Bulls t-shirts and Blackhawk knit-caps borrowed or gifted from friends. True allegiance is an identity, and it takes time to develop. But I wonder how much time? And what cost is there in loving all some but not all one? Because surely there is a cost, as there are costs for all things.